This website is dedicated to “Australia’s Own Car”, The 48-215 and FJ Holden. All information that is placed on this site is information that has been gathered over the last 25 years or so. 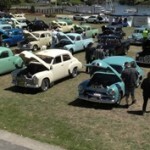 fxfjholden.com would love to hear from anyone that has any stories about these wonderful motor cars, so sit back and take a ride (or click) through the 48-215 and FJ Holden motor car website. Australian Early Holden Federation Nationals will be held by the Canberra FX FJ Club, in Cooma New South Wales between 28th – 30th December, 2020. The nationals are run every two years with the last Nationals was held in Murray Bridge, South Australia between 28th – 31st December 2018. 2020 AEHF Nationals in Cooma, New South Wales. The 2019 (42nd) Victorian State Titles will be held by the FX FJ Holden Club of Australia – Melbourne Chapter. Further Details will be added soon. There is no information available for the next Queensland State Titles. If any persons or members of the Qld clubs have any details, please contact the webmaster. If you would like to make a donation to fxfjholden. All donations will allow for the site to be developed and more features added. To make a secure donation via PayPal click on the Donate button below.